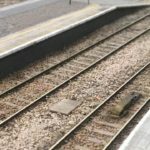 Track construction techniques to minimise noise. 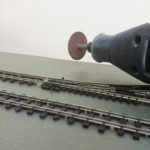 Martin Claydon of www.dcc-updates.uk built a layout using traditional cork underlay and PVA but was unhappy with the noise from the track and tested alternative track laying techniques to find the quietest track laying solution. Here’s are his findings. Three small test tracks were used to evaluate noise levels and to explore assembly techniques. 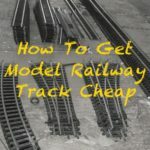 The next test track used code 75 rails glued to a strip of Woodland Scenics foam track bed. Approximately 60% of this test track had stone ballast applied, using 1:1 diluted Copydex adhesive. The final test track used code 75 rails glued to 2.5mm cork underlay. Again approximately 60% of this test track had stone ballast applied, using 1:1 diluted Copydex adhesive. The test tracks use identical softwood bases and use identical ballast material (medium size Woodland Scenics grey coloured stone ballast material). 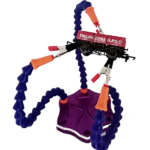 The test tracks can be connected together so that an item of rolling stock can be propelled by hand directly from one track to the next. The quietest section of track was the Woodland Scenic foam with no ballast cover. However, this is not a practical solution for cosmetic reasons. Next quietest was test track 2, the Woodland Scenic foam with Copydex glued ballast. This was not noise-free, but the sound characteristic was at a lower level than the other ballasted options and the noise spectrum appeared to cover a lower band of audio frequencies. The cork underlay and PVA ballast glue track, test track 1, was the noisiest of the three track systems. The noise spectrum appeared to occupy a higher band of frequencies than the other track options. The higher frequency content added to the detrimental impact of the noise on the realism of the scene. The cork underlay with Copydex ballast glue, test track 3, came roughly midway between the other two ballasted options in terms of noise level. The band of frequencies generated was similarly about mid-way between the other two options. The use of a non-rigid-when-dry latex based glue such as Copydex, diluted to secure fine grain stone ballast, gives a worthwhile improvement in noise levels compared to results using PVA ballast adhesive. 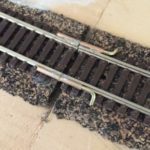 The 5mm thick Woodland Scenics Track-Bed provides a significant improvement in both the noise level and the frequency content of model rail running noise when compared to 2.5mm cork underlay. It is reputed to have an indefinite life compared to the soft foam underlay produced by Hornby and Peco, which I understand bio-degrades, starting to disintegrate after circa 2 years of use. 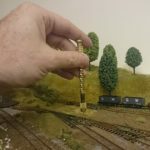 The 5mm height of the Woodland Scenics material is probably prototypical for high-speed main lines but may require some camouflage on branch lines and through stations. 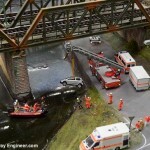 The Woodland Scenics foam without ballast gave the best results. However, for visual realism, the Copydex fixed ballast is essential. 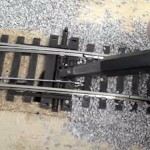 Although the ballast made a small degradation to the sound characteristics, this combination offers the best compromise and I’ll use this approach will be used on the high-speed sections for new layouts. The 5mm depth of the foam strip means that sheet material will be needed in the station areas to avoid the need for excessive quantities of ballast material in between the tracks. Also, platforms may need to be mounted on 2mm plasticard foundations to achieve the correct height with respect to the rails. Read Martin’s the original post here. Interesting article. I use (as much as possible) old estate agent boards for the baseboard, multi-layered into a monocoque construction and stuck together with a hot-melt glue gun. Raised up strips for the track-bed. 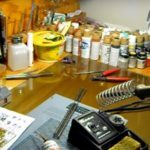 Little noise and dead cheap (can’t get cheaper than free)! 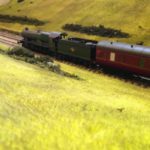 My layout is not transportable but it is able to be broken down – I hope, as we are moving house very soon. I just run the stuff straight over to the next board, and will have to cut it as well as the track, which may be a little traumatic… Anyway, I have cheated in some instances by using ply board that I hoiked out of a skip and built layers up on that in some instances, then you can chop into it with a sharp modelling knife to make different levels, or add strips where the track-bed is going. I hope to do a feature for the modelling press eventually. I do have some pictures. Ah, the ply would help with the keeping things even. It’s a great idea. I’ll drop you a line privately. Cheers, Andy.